Few people outside Scotland appreciate the intensity of affection, which the Scots have for Robert Burns. To his fellow countrymen he is more than a poet. His homely phrases, such as “a man’s a man for a ’that” entered the language and exalted both the Scottish character and the Scottish tongue. Burns was a poet and writer of traditional Scottish folk songs whose works are known and loved wherever the English language is read. The Scottish bard was born in a clay cot­tage at the picturesque village of Alloway near Ayr in Scotland on 25th January 1759, the eldest of a family of seven born to Wil­liam and Agnes Burnes. William Burnes was a struggling tenant farmer. Burns’s moth­er had a beautiful voice and taught her son old Scottish songs and ballads, which he later turned into his best poems. The Burnes family hailed from Kincardineshire, but William had moved south in the aftermath of the Jacobite* rebellion, first to Edinburgh and then to Ayrshire where he was employed as a landscape gardener. In 1757, he mar­ried Agnes Brown. *Jacobite — in Britain, a supporter of the royal house of Stu­art after the deposition of James II in 1688. The future poet’s earliest years were spent in the cottage which William Burnes had erected on a portion of the land, which he had feud as a market garden, and it was here that he and his brother Gilbert received their brief formal education at the hands of their teacher John Murdoch. Although pov­erty limited his formal education, Burns read widely in English literature and the Bible and learned to read French. He was encouraged in his self-education by his fa­ther, and his mother acquainted him with Scottish folk songs, legends, and proverbs. Ardous farm work and undernourishment in his youth permanently undermined his health, leading to the rheumatic heart dis­ease from which he eventually died. In 1765, the family moved to Mount Olifant, a 70- acre farm two miles away. It was here, in the autumn of 1774, that Burns wrote his first song Handsome Nell as a tribute to the girl with whom he was partnered at harvest-time. With the exception of the Tragic Fragment (in blank verse), all of Burns’s early compositions were lyrics to well-known melodies of the period, and song writing was to be his principal metier till the end of his life. At Whitsun* 1777 the Burnes family moved to Lochile, a hill farm of 130 acres in Tarbolton parish. *Whitsun — the seventh Sunday after Easter which celebrates the coming down from heaven of the holy ghost. Three years later Burns took a leading part in founding the Tarbolton Bachelors’ Club, a debating society widely regarded as the prototype for the many Burns clubs now flourishing worldwide. Burns went in 1781 to Irvine to learn flax dressing, but when the shop burned down, he returned home penniless. He had, mean­while, composed his first poems. The poet’s father died in 1784, leaving him as head of the family. He and his brother Gilbert rent­ed Mossgiel farm, near Mauchline, but the venture proved a failure. But the death of his father had a liberating influence on Robert. In 1784, the great deal of the poet­ry, which would appear in his first edition was composed in this brief period. In 1784, Burns read the works of the Edin­burgh poet Robert Fergusson*. *Fergusson, Robert (1750-1774) — Scottish poet. His realist and humorous poems greatly influenced Robert Burns. Under his influence and that of Scottish folk tradition and older Scottish poetry, he became aware of the literary possibilities of the Scottish regional dialects. During the next two years he produced most of his best-known poems including The Cotter’s Saturday’s Night, Hallowe’en, To a Daisy and To a Mouse. In addition, he wrote The Jolly Beggars, a can­tata chiefly in standard English, which is considered one of his masterpieces. Burns further angered church authorities by having several indiscreet love affairs. In 1785, he fell in love with Jean Armour, the daughter of a Mauchline building contrac­tor. Jean soon became pregnant and although Burns offered to make her his wife, her fa­ther forbade their marriage. Thereupon (1786) he prepared to immigrate to the West Indies. Before departing he arranged to is­sue by subscription a collection of his poet­ry. Published on July 31 in Kilmarnock in an edition of 600 copies. Poems. Chiefly in the Scottish Dialect was an immediate suc­cess. In September Burns abandoned the West Indies plan; the same month Jean became the mother of the twins. He moved in the autumn of 1786 to Edinburgh, where he was lionized by fashionable society. Charmed by Burns, the literati mistakenly believed him to be an untutored bard. He resented their condescension and his independence, blunt manner of speech, and occasional social awk­wardness alienated admirers. While Burns was in Edinburgh, he success­fully published a second, 300-copy edition of Poems (1787), that earned him a consid­erable sum. From the proceeds he was able to tour (1787) the English border region and the Highlands and finance another winter in Edinburgh. In the meantime he had re­sumed his relationship with Jean Armour. They were married. In June 1788, Burns leased a poorly equipped farm in Ellisland, but the land proved unproductive. Within a year he was appointed to a position in the Excise Serv­ice, and in November 1791 he relinquished the farm. In 1790, his masterpiece Tam o’Shanter was written. Burns’s later literary output consisted al­most entirely of songs, both original compositions of traditional Scottish ballads and folk songs. He contributed some 200 songs to Scots Musical Museum (6 volumes, 1783-1803), a project initiated by the engraver and music publisher James John­son. 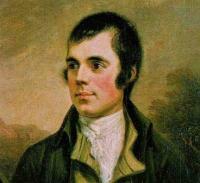 Beginning in 1792 Burns wrote about 100 songs and some humorous verse for Select Collection of Original Scottish Airs. Among his songs in this collection are such favourites as Auld Lang Syne, Cornin’ Thro’ the Rye, A Red, Red Rose and John Ander­son, My Jo. After the outbreak of the French Revolu­tion, Burns became an outspoken champion of the Republican cause. His enthusiasm for liberty and social justice dismayed many of his admirers: some shunned or reviled him. After Franco-British relations began to de­teriorate, he curbed his radical sympathies, and in 1794, for patriotic reasons, he joined the Dumfriesshire Volunteers. Burns died in Dumfries on July 21, 1796. A memorial edition of Burns’s poems was published for the benefit of his wife and children. Burns touched with his own genius the tra­ditional folk songs of Scotland. He immortalized its countryside and humble farm life. He is one of the most popular song writers of English literature. Some of his songs were original, others were inspired by a line or phrase from one of the many ballads in the Scottish dialect. From the oral folk tradi­tions he learned a great deal about song rhythms and the fitting words to music. Ballads, brief stanzas, epitaphs, epigrams and personal lyrical verse were the most favour­ite forms of Burns’s work. The stylistic de­vices, which the poet frequently used to ex­press his ideas were refrain, repetition, alle­gory, personification, parallelism and epithets. Burns’s popularity with his fellow-country­men is reflected in celebrations held all over the world on “Burns Night”, 25 January, his birthday.